Life history: Mekda was one of Ekuar's rockshaper friends, the three of which went to find the Palace of the High Ones as youngsters. They were captured by trolls and enslaved for millennia for their useful rockshaping abilities. 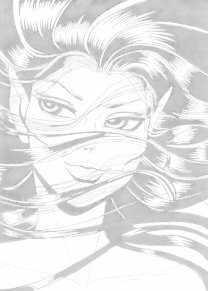 Osek and Ekuar eventually managed to escape, but Mekda remained in the trolls' service, her body and mind slowly withering away under the trolls' cruel care. They called her Sack o' Bones, since that was about all that was left of her. Her last mission was to shape a hole in the Go-Back lodge while most of the Go-Backs and Wolfriders were away so the trolls could attack the children, but when that attack was fended off the trolls forgot about her and she froze to death.